There's a new man on the Moon! Why is OctoberFest in September? Join the Ship of Geeks! 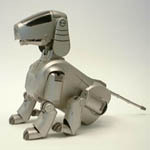 Robot Dog sells out in one day! Join the Search for Aliens! Look up in the sky, it's a Flying Car! Geek Pride Day was great! Geek Pride Festival! 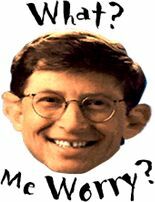 The geeks are out there, and they want they're money back! And so are the geeks at NASA! Attempt fails, the future's a little bit darker. "You're all wrong... 2000 is NOT THE MILLENNIUM!" Internet Addicts  theyre out there! Its been scientifically tested and provenpeople can get addicted to the net. Watch out Jerry Springer. The man who pays $3 million for a baseball comes out of the geeky closet! In a hybridizing experiment called WebTV, the 'tube mates with the 'net. New yummy iMacs! Five new colors... same great taste! Microsoft product developers gleefully murder the beloved paper clip assistant. Rats in Uganda have an Anti-Technology Agenda. Uganda would not be unwise to consider there may be a conspiracy involving Rats and their need to destroy technology. The Canadian military is preparing for disaster.... Y2K style! Predicitions of what computers will be like in the year 2002, (if everyone survives Y2K). Although (the Y2K problem) is a terrible distraction and there will be some disruption, there has been a little bit of a windfall for some participants in the IT industry," (The problem is) "below the middle of the panic (levels) some people have suggested."